In a large dutch oven, heat the oil over medium heat. Add as many chicken pieces as will fit skin side down to the skillet. Brown until golden on both sides, about 5 minutes per side. Transfer the chicken to a plate and brown any remaining pieces in the same manner. Transfer those pieces to the plate. Add the sliced sausage to the drippings and cook until brown around the edges, about 5 minutes. Transfer the sausage to a plate. Drain and reserve 3 Tablespoons of the drippings in the pan. Add the onion, celery, and bell peppers and saute until softened, about 5-7 minutes. Add the garlic and saute for another 2 minutes. Add the cayenne, thyme, salt, and black pepper. Stir in the rice and saute for 5 minutes. Pour in the stock, add bay leaves, and bring to a boil. Reduce the heat to a simmer. 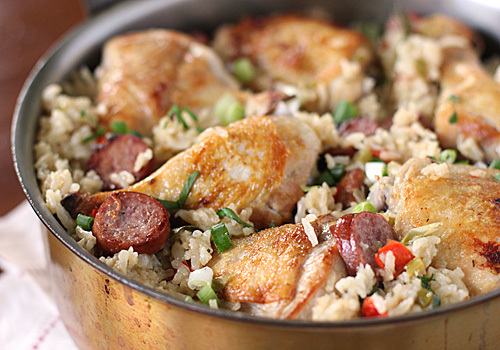 Return the chicken and sausage to the pan, cover and cook until the broth is absorbed and the chicken is cooked through, about 20 minutes. Gently fluff the rice with a fork, cover and let rest for 10 minutes. Garnish with chopped green onions and fresh parsley. Enjoy!